I met Felicity from HoneyPot at a Thursday Infused event with The Herb Somm and was excited to discover that she, too, was a Taiwanese American in the cannabis industry. I had a great time connecting and plans for brunch were soon made. 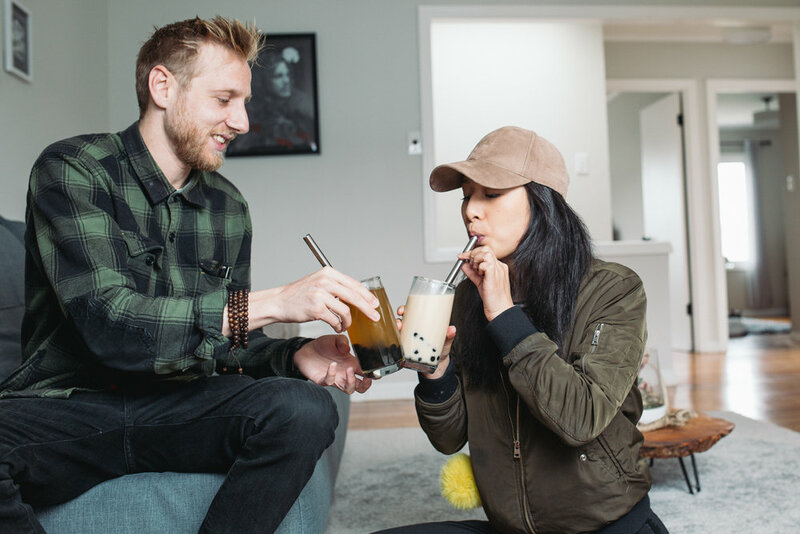 While menu planning, it was clear I had to make boba tea (aka bubble tea.) The boba, or tapioca pearl, trend started in the late '80's in Taiwan. The "QQ", or chewy, gummy bear-esque texture is very popular in Taiwanese cuisine and soon street food vendors were combining the tapioca pearls with teas and shaved ice. Decades later, the trend is still going strong. It's only appropriate for us to create a medicated version to celebrate Asian Pacific American Heritage Month. 1. Cook tapioca pearls according to the instructions on the package. 2. Strain the tapioca pearls and mix in HoneyPot until fully coated. 3. Place the tapioca pearls at the bottom of two cups. Using a cocktail shaker, shake the ice, cream, and tea. Strain into each cup and serve with a fat straw. *Note: HoneyPot contains 8mg of cannabinoids per tablespoon. Feel free to mix regular honey into the recipe to lower the dosage per person if it is too high. Please wait one to two hours, then make an informed decision on whether to consume more. Always dose carefully and listen to your body, and never drive under the influence of cannabis.